The Russian chemical industry giant Akron is about to build more tanks for ammonia and liquid fertilizers at the terminal in the northeastern Estonian city of Sillama, reports LETA/BNS according to Interfax information. The environmental impact assessment report for the terminal has been endorsed by the city government of Sillamae, the regional newspaper Pohjarannik said. In accordance with the plan, two ammonia tanks with a capacity of 30,000 tons each, two 20,000-ton tanks for liquid nitrogen fertilizers, two 3,000-ton tanks for liquid fertilizers and three 5,000-ton tanks for liquid nitrogen fertilizers will be built. In addition a burner for burning ammonia gases is to be built. 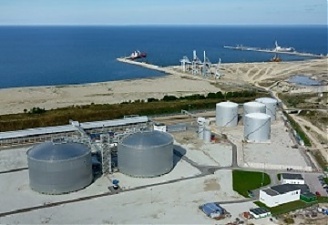 The company is planning to increase the handling of liquid ammonia at Sillamae to 1.5 mln tons a year and the handling of liquid fertilizers to 1.9 mln tons a year.